To Be or Not to Be…Specialized! There’s been a few conversations on the pool deck about when and if kids should swim exclusively. It’s a fact that our country’s sports have changed dramatically since we were kids. Sports were mostly free and school-based. Plus, kids didn’t do just one sport, but many. Today, there’s a trend around the world for kids to specialize at an early age in one sport. If you “google” sports specialization, you’ll find tons of articles with research telling you why this is such an awful thing. social isolation, burn-out and repetitive use injuries. Also, the research cited states there’s no clear advantage to starting in a single sport, year-round at an early age. I have an opinion on sports specialization that relies on mom-based research — observing, listening and talking to hundreds of kids, parents, and dozens of coaches for years — however, it’s limited to the sport of swimming. First, I have to disagree with this statement: “Being on a select team often requires a year-round or near year-round commitment and extensive travel. If you allow your child to participate she can end up socially isolated from her family, peers, and the larger community.” from momsteam. The swim team for my kids was social. Friendships blossomed with kids they’d otherwise never meet. Vacations through the years meant jumping in as a visitor with local teams and meeting more kids. At first my children were wary and out of their comfort zone, but their self-confidence and world grew exponentially. Swim meets meant playing cards, “Catchphrase” and charades for hours under the tent with teammates — and racing for a minute or two. My daughter didn’t have time to hang out at the mall, but she did travel to Puerto Vallarta with kids from throughout So Cal to meet up with kids from the Pacific Northwest, Northern California, Mexico and Canada. The coaches from the Puerto Vallarta trip witnessed an eye-opening swim meet for our swimmers. Our kids experienced another culture, interacted with local kids, and learned to appreciate small things they took for granted in Southern California. I’d love to hear what you have to say about this topic, too! When did your kids begin organized sports? Did they participate in more than one? At what age did they specialize? Check back for more on this topic. I have a lot more to say about it! This entry was posted in Kids, Parenting, Sports Specialization, Swimming, Youth Sports and tagged parenting, social isolation, specialization, sports, sports specialization, swimming, youth sports by bleuwater. Bookmark the permalink. My kids were swimmers too. My daughter was 6 when we started and my son joined when he was 6 because he was being dragged to practice anyway and by that time he wanted to be part of the team. We didn’t have the same experience as you. My kids stopped after high school and their club swimming was not so competitive…we participated mostly in just local meets. But everything you said about it is true! The friendships we all made through swimming will be lifelong. We started with summer swimming on a tennis/swim club team….Miami Hills Dolphins in Cincinnati OH. When we joined the club, we didn’t know anyone or anything about swimming. My neighbor took my daughter to a meet at the club and when she came home with stars in her eyes, how could I say “no”. It sounded like fun. We made a move to Kansas City when my kids were 7 and 10 and they both cried because we were ruining their lives. It was swimming that saved them. I heard them tell their Cincinnati friends that they were joining the swim team in Overland Park, KS. There was a comfort level for both of them and instant friends. Swimming was what they all had in common. But to be honest, the swimming was not what kept them close buddies. It was the card games, the snacks, the music they shared before and after their 20 second race. It was fun with the coaches and the pizza party after home meets and the banquet at the end of the season that sealed these friendships. My kids learned to find success in their own progress (best times) and not just in winning or losing a heat, an event, or a meet. 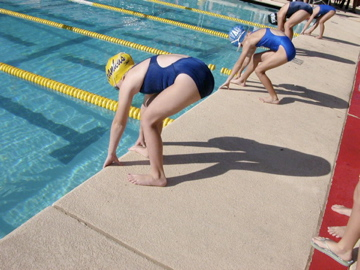 They learned how to encourage others…especially new, young swimmers who looked up to them as role models. They learned how to work hard and be responsible for themselves. 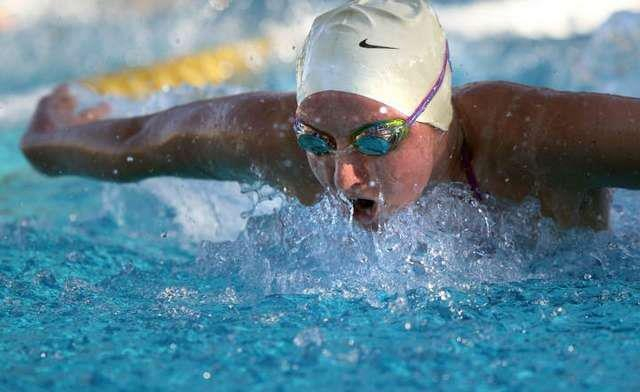 Swimmers are some of the best athletes because of the endurance training. And when our swim life officially ended when my son was a senior in high school, I remember feeling a huge sense of loss. These were my friends too. Because we had been swimming for 15 years, I never thought about it ending. So when I say that the smell of chlorine sends endorphins in my veins, or the sight of a beautiful pool makes my heart skip a beat you will understand that it was the life of my family for so many years. Yes, we sprinkled in a few seasons of t-ball, baseball, basketball, and volleyball. But it was specializing in swimming that was the best decision my kids ever made. And yes, it was their decision. Thank you, Debbie for sharing your great experiences as a swim mom. It’s my youngest child’s senior year this year, and I know how you feel about having your swim life ending! She will be swimming in college, but I know as a parent, that will be an entirely different experience for me. 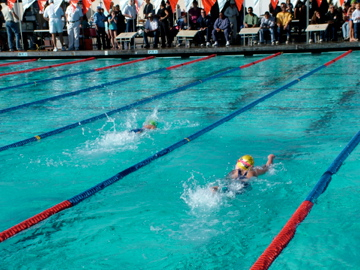 I agree that having your kids specialize in swimming has to be because they want to do it and love it. Thank you! It’s nice to get your feedback. Thank you for reading my blog! I’ll keep writing.